Garnet, the official birthstone for the month of January, signifies Love and Trust. The word "Garnet" is derived from granatum meaning seed and is called so because it resembles to a pomegranate seed. In Greek mythology, a pomegranate is referenced as the gift of love and is associated with eternity. 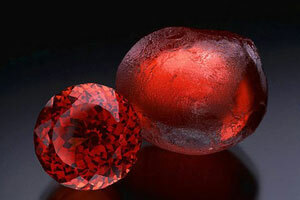 Now-a-days, Garnet is referenced as the gift of love. This deep red hue is considered to be the one of the best gifts on 2nd and 6th anniversary. Garnet comes in many colors of rainbow from deep red to vibrant green. Garnets are found in metamorphic and some igneous rocks. They are formed under extremely high temperatures and pressure. Highest quality Garnets come from East Africa. Other regions where Garnets are found are in certain parts of Europe and South America. Garnets were at the height of fashion in the 18th and 19th century, and are found in many antique jewelry items. Amethyst! 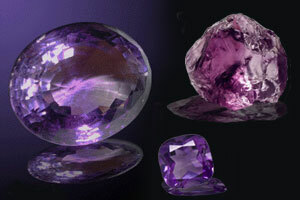 A purple variety of mineral quartz is a popular birthstone for the month of February. This purple gemstone is symbolic to royalty and spirituality and it is available in many different purple shades. Amethyst is derived from the Greek word "Amethystus" meaning "protection against intoxication". The structure of amethyst is long prismatic crystals that have a six sided pyramid at either end. Amethyst was first found around 3000B.C. Amethyst is one of the most popular gems used in jewelry and is the symbolic gemstone for the 17th wedding anniversary. Amethyst Jewelry looks amazing and can be worn at any time or in any occasion. Amethyst is found in many countries like Australia, Russia, South Africa, Namibia, Zambia, Uruguay, Bolivia, Argentina, Brazil, Mexico, Canada and the United States. You can add a pop of vibrant color with royalty to any outfit when you choose jewelry featuring the traditional birthstone for February. The gemstone Aquamarine is the March Birthstone and the birthstone of Scorpions (Zodiac Sign). The word Aquamarine is derived from the Latin words "aqua marina" which means "sea water" which reflects the color of the crystals. This gemstone was first mined in 1811 in Brazil. But history says that it was used between 480 and 300 BC. This Gem was used by Greeks to make aquamarine jewelry. In the middle ages, people believed that this gem stone could magical overcome the effects of poison.Aquamarine captures the beauty of the sea. This stone is also found in a range of pastel blue and greenish blue shades. Legends say that aquamarine is the treasure of mermaids, with the power to keep sailors safe at sea. The power gets stronger when it is immersed in water.This stone has a soothing influence on relationships, especially on married couples. Also a dream of aquamarine means that you will meet new friends. Darker the color of the stone, the more valued it is.Aquamarines are mined in a number of places like Nigeria, Madagascar, Zambia, Pakistan and Mozambique, but most of the gemstones available today come from Brazil. When this Aquamarine Stone is worn, it will bring happiness, love, affection, and care. Happy birthday to all our April born fans. Remember your birthstone is "The Diamond". As it is rightly said "A Diamond is forever". Diamonds are a symbol of royalty and purity. This gemstone was named as "adamas" by Greeks which mean "invincible". A diamond is said to bring its owner wealth and happiness as well as protection. It is well known that Diamond is the hardest substance found in nature, but few people realize that Diamond is four times harder than the next hardest natural mineral, corundum (sapphire and ruby). Diamonds are thought to be first found in India and since then have been used for making jewelry. Diamonds are found in many areas including South Africa, Russia, and even in Arkansas in the USA. A gift of a Diamond is symbolic of everlasting love. Diamonds are the anniversary gems for 10th and the 60th years of marriage. The diamond's white hue symbolizes life, joy and purity. Diamonds are the ideal gift for a loved one and it symbolizes strength and courage. Diamond is also symbolic of a long lasting relationship and has earned the heart of many people around the world. True diamond can be known as the "King of all Gemstones". 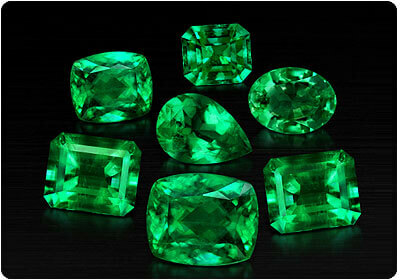 Emerald is the birthstone for those who were born in the month of MAY. The word EMERALD is derived from the word "Smaragdos" which means "Green stone" and this reflects the color of the emerald. Emeralds are from the beryl family of minerals and were Cleopatra's favorite gemstones. This stone Emerald is a symbol of faith, courage and foresight and it signifies wisdom, growth and patience. This gemstone is said to be highly priced in terms of antiquity. A special rectangular cut called the "Emerald cut" was developed since Emeralds can be easily destroyed. Emeralds were first mined by ancient Egyptians in the eastern desert region about 2,000 years before Cleopatra's birth. But emerald mines were claimed by Cleopatra during her reign.Emeralds are found in Columbia, Brazil, Tanzania, Zambia and Zimbabwe. Columbia is said as a source of the finest emeralds. Emeralds, the May birthstone, are indeed soothing and beautiful to gaze upon. Historically associated with love, fertility, and rebirth, emeralds are a perfect choice for the springtime month of May. The ones born in the month of June, your birthstone is "The Pearl". The word 'Pearl' is derived from the Latin word "pirum" which means "pear" and this reflects the shape of this gemstone. Pearls are unique as they are the only gems from living sea creatures and require no faceting or polishing to reveal their natural beauty. Natural Pearls are formed inside oysters. It is a hard object produced within the soft tissue of a living mollusk and it is made of calcium carbonate. The ideal pearl is perfectly round and smooth, but many other shapes of pearls occur. Ancient Egyptians valued pearls above other precious metals. The oldest pearl necklace is thought to be inside the sarcophagus of a Persian princess who died in 520 B.C. Before the creation of cultured or manmade pearls, they were reserved only for the noble or rich. In the early 1900s, the first successful commercial culturing of round saltwater pearls began. Since the 1920s, cultured pearls have almost completely replaced natural pearls in the market. Some of the qualities associated with this gemstone are loyalty, faithfulness and friendship. Moonstone is another birthstone for the ones born in the month of June and is the best gift for 13th anniversary. This gemstone belongs to the family of feldspars (the mineral that occurs in many igneous and metamorphic rocks.). The name "Moonstone" was derived from the belief that the stone's appearance changed with the changing phases of the moon and this name was given by Romans in ancient times. 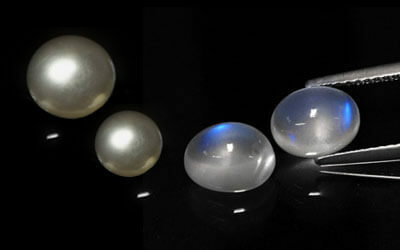 Moonstones are found in many places like USA, Brazil, Australia, Myanmar and Madagascar, but the most valuable moonstones are traditionally of Sri Lankan origin, and have a shimmering pale blue color. Some of the qualities associated with this gemstone is good health and symbolize the unfolding of spiritual and psychic development. Another birthstone of this month is "Alexandrite". Alexandrite is a form of "chrysoberyl", which is formed in the earth's crust. 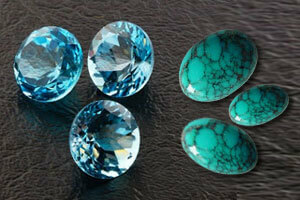 These gemstones are very rare and have a quality of changing its color. This gemstone was first discovered in the Ural Mountains of Russia during the reign of its namesake, Czar Alexander II. The stones from this region usually are the highest quality, largest in carat size and aesthetically beautiful. Alexandrite is said to bring joy, good luck and improve self-esteem. Rubies, one of the most sought after gemstones, are the birthstone for the month of July. Rubies are made from Corundum, one of the hardest substances and thus Rubies are the second in hardness after Diamonds. The name "Ruby" comes from the Latin word "ruber" which means RED, which reflects the color of the gemstone. Rubies are primarily used for ornamental jewelry. They are the perfect gemstones for creating high quality jewelry. They are strong, resistant to scratches and their color never fades out. Rubies were mined some 2,500 years ago. The most beautiful rubies are found in Burma, quality rubies are found in the following countries: Sri Lanka, Kenya, Tanzania, Afghanistan, India and many more. 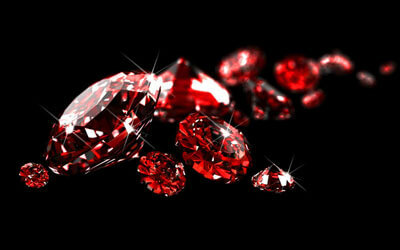 Rubies, known as "the king of gems", are traditional crystals for 15th and 40th anniversaries. Some of the qualities associated with this gemstone are vitality, confidence and strength. Peridot, pronounced as "pear-a-doe" is known for its shimmering yellow- green color and is the official birthstone for the month of August. Peridot is known as "gem of the sun" and is derived from the Greek word "faridat" which means "gem". 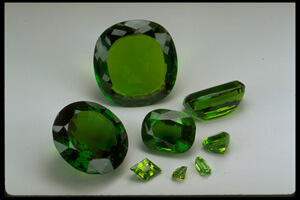 Peridot is a variety of olivine. And are mined some 1500 BC on Saint John's Island near Egypt. Peridots are found in Arizona, China, Myanmar, and Pakistan. Peridots are believed to bring royal dignity upon its wearer. The name Sardonyx comes from the Greek word Sard "reddish brown" and Onyx "veined gem". Sardonyx is a variety of the silica mineral called chalcedony. Sardonyx is a form of onyx and is recognized by its layers of reddish brown and white banding. This gemstone is especially good for engraving. Sardonyx can be a wedding/ anniversary gemstone for the 7th and 10th year of marriage. Sapphires, christened, "the gem of soul and autumn" - a fitting name for the September's birthstone. It is aligned with the planets of Saturn and Jupiter and commonly used for the 6th and 45th Anniversaries. Sapphire, a transparent precious stone is one of the most beautiful gemstones and the birthstone for the month of September. Sapphire is named after the Greek word "sapphirus", meaning blue. Sapphire is a variety of the mineral corundum and occurs in many colors. Sapphire is second only to the Diamond in hardness, making it a durable gemstone for setting into jewelry. Sapphire has a long and interesting history that dates back to 800 B.C. 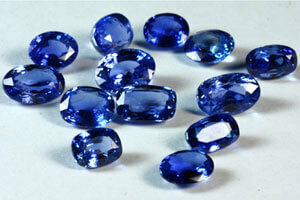 Sapphires come from Sri Lanka, Thailand, Australia, and Cambodia. Nigeria, Kenya, Tanzania, China, Vietnam, Madagascar, and also the United States are some other sources. Opal, commonly known as "opalus" (meaning "a stone") in Latin is the birthstone for the month of October. Opal is found in various shimmering colors with elegant flashes of yellow, orange, green and many more. The opal is often considered to be the most beautiful and desirable of all gems because it is highlighted with all the colors of the rainbow. Opal is formed from particles called amorphous silica which is found between the cracks in rocks. This birthstone is very brittle and sensitive to heat so this gemstone can be molded in any form. Opals were first discovered in 1872 in the deep caves of Australia. 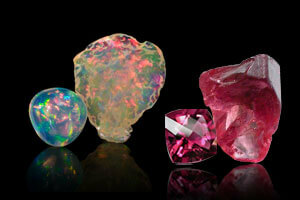 Opals are also found in Mexico, U.S and many other countries. This gemstone captures the imagination and inspires legends - a fantastic gem for jewelry and gifts. An alternate birthstone for the month of October is Tourmaline. With its rainbow of colors, tourmaline is an endless source of artistic inspiration and so it is called the "rainbow gemstone". Tourmaline comes in a variety of colors depending on the minerals present when the gemstone was formed. Tourmalines are found in many countries having the major deposits in Brazil, Sri Lanka and many more. Tourmaline is considered as one of the best gemstones in terms of jewelry, as you can get the best jewelry without breaking your budget. One of the very gorgeous gemstone is Yellow Topaz, the birthstone for November. 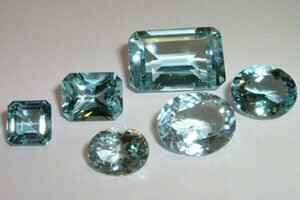 The name "topaz" is derived from the Greek word "Topazos". Topazos means any stone that is of the color yellow. Topaz is a silicate mineral of aluminium and fluorine that is found in pegmatites near silica rock that are volcanic in origin. While yellow topaz is the most common type of topaz, but it is available in many different shades of yellow. 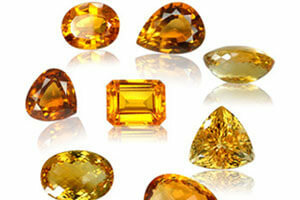 Yellow topaz is one of the great choices for jewelry and it ranks 8 in terms of hardness on the moh's scale. Jewelry with yellow topaz is the best choice for daily wear. Though Yellow Topaz is found in many different regions of the world, there are vast sources in Europe, specifically Germany. If you are looking for simple though fashionable jewelry within your pockets, yellow topaz jewelry is the best choice. The name is derived from the color - the yellow of the lemon, although the most sought-after stones have a clear, radiant yellowish to brownish red. Like all crystal quartzes, the citrine has a hardness of 7 on the Mohs scale and is thus, to a large extent, insensitive to scratches. Citrine is known as the lucky "Merchants Stone". It is a symbol of hope and strength and this November jewelry makes the best gift for any occasion. Citrine jewelry serves the best gifts for 13th and 17th anniversary. Citrine is a rare gemstone in its natural state and they are mainly found in Brazil. There are three different birthstones associated with the month of December: Blue Topaz, Turquoise and Tanzanite. All three birthstones vary in its properties but have one thing common i.e its unique blue color. When gifted to a loved one, the blue topaz symbolizes eternal love and faithfulness. The word Turquoise is derived from the Greek word "Turkois" which means "Turkish"; it is so called because it was first brought from Turkey. Turquoise is a mineral consisting of copper aluminum phosphate. Turquoise is the only gemstone belonging to the phosphates family. Turquoise is found in the following countries: Iran, United States, Africa, Australia, Siberia, and Europe. Turquoise is the Wedding anniversary gemstone for the 5th and 11th year of marriage. Turquoise is symbol of happiness, success and good fortune for those born in the month of December. This extraordinary gemstone was discovered in 1967 was enthusiastically celebrated by the specialists as the 'gemstone of the 20th century'. It is named after the East African state of Tanzania, the only place in the world where it has been found. Tanzanite is blue, surrounded by a fine hint of purple. It consists of calcium aluminium silicate and is not particularly hard, having a value of 6.5 to 7 on the Mohs scale. Find an amazing gift for your loved ones at our store.